From The Earth: Blog: Happy Birthday at FTE! At From the Earth we are never too busy to celebrate our people and have some fun! Yummy cake, good food and tasty treats, what more could we ask for? The month of May was especially blessed with numerous birthdays! 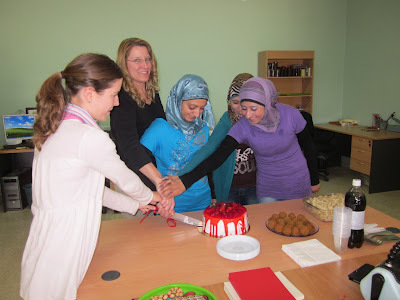 So here's a big HAPPY BIRTHDAY to Courtney, Heather, Mariam, Hanan and Mariam! May your days be filled with warm, fun memories for the rest of the year!